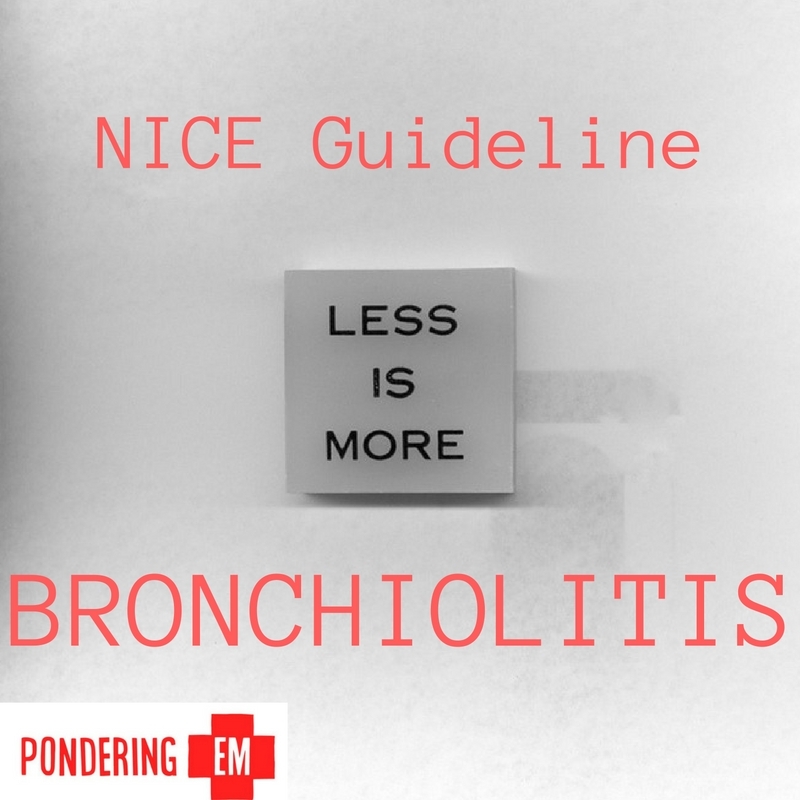 You are here: Home / Journal Club / NICE on Bronchiolitis: Less is More! As the nights get longer and the weather gets cooler emergency departments across the UK will see an increase in unwell children. The vast majority will have a self-limiting illness and can be safely discharged with appropriate safety netting. 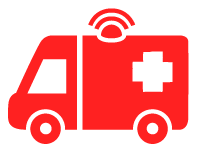 The emergency clinician’s role is crucial in identifying the children that require an in-patient stay. Infants with cough, increased work of breathing and a fever are going to start pouring in. ‘Tis the season to be bronchiolitic. Bronchiolitis is characterised by inflammation of the small airways (bronchi and bronchioles) caused by a viral pathogen – most commonly respiratory syncytial virus. It is a disease of the under 2s, and virtually all kids will get it. Oedema and excess mucous production reduce the diameter of the small airways. This presents clinically with a cough, coryzal symptoms and increased work of breathing to maintain ventilation. Auscultation of the lungs will often demonstrate a wheeze and transmitted upper airway sounds. Reduced oral intake and dehydration are a feature of more severe cases, as are apnoeic episodes. 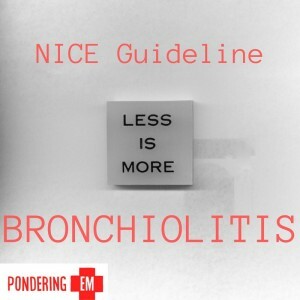 Last year, NICE released updated guidance on how to manage bronchiolitis (1). Much of this relates directly to who can be discharged from ED/short stay wards, and who requires admission. The child must be under 2, though it’s most common between 3-6 months. The worst symptoms are normally between day 3 and 5. The cough is the longest symptom to resolve, and that takes less than 3 weeks in 90% of ‘bronchs’. Apnoea can be the only clinical sign in infants less than 6 weeks old. This depends on two features of the case: clinical features of the episode and underlying co-morbidities. 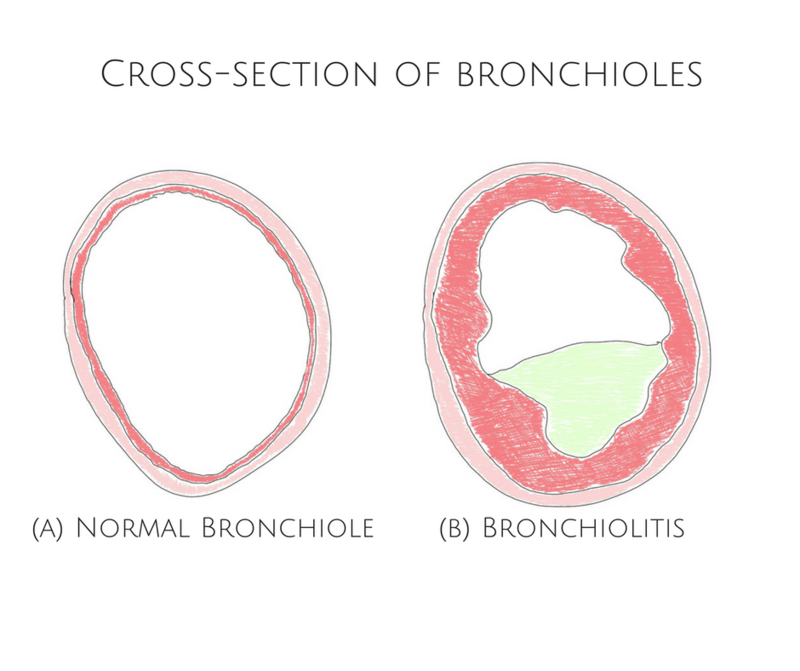 Bronchiolitis should be diagnosed on clinical grounds. Routine bloods, a chest X-ray and blood gas testing are not recommended. Capillary blood testing should only be considered in severe cases – when supplemental oxygen concentration is greater than 50%. Routine nasal airway suctioning is only recommended in kids who are suffering from apnoeic episodes. 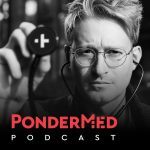 So, what should you do in the ED? 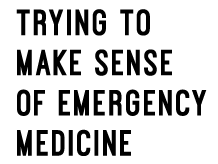 The management of bronchiolitis can be summed up in 3 words: Less is more. Avoid unnecessary and potentially harmful treatment and investigations in these little ones. Clear and careful parental reassurance is easily the most important intervention in the overwhelming majority. Keeping these kids hydrated and fed is crucial, and so often it’s safer for them to be managed at home. Supplemental oxygen should be given if saturations are less than 92%*. Give supplemental feeding via nasogastric tube if they’re not tolerating anything orally. Apnoea? Consider suction of upper airways. *There is no firm consensus across international guidelines amongst what oxygen saturation level is appropriate. An interesting recent trial published in the Lancet (currently open access) showed no change in length of symptoms with a target saturation of 90% (2). When kids have impending respiratory failure, they show signs of exhaustion (‘listlessness’, feeble respiratory effort), have recurrent apnoeas, and fail to maintain saturations despite high flow oxygen therapy. A trial of CPAP should be commenced. It goes without saying that these cases require immediate senior paediatric involvement. However, bronchiolitis kids that need CPAP are exceedingly rare. Phew.